I won this! Will be reading shortly..
didn't get as much reading done as i thought over the holidays, but did start this - up to p30, and so far it's a strange but compelling combination of (descriptions of) childhood play and induced labour.. Mixes fairy tale, satire (of the medical profession and its lecture circuit), technical language, hallucination and realism and can be a mite confusing. It is deliberately obscure in places to heighten tension. Although a little confused I was gripped, especially by the childhood scenes- the part where the children run off pursued by a policeman across a swampy building site is tremendous: The slab Zelda was standing on squelched beneath her like a spoon in jelly. I did hanker after more on the murder, and maybe more on the professor and Zelda’s husband, but Zelda herself is a fully rounded character, flawed and manipulated and drugged, she finally breaks free of all. For me what impressed most was the language (see the lines and phrases quoted above), well observed and precise:The wine, meant to be white, lapped green in the glass, gathering, when it was moved, small black shadows, like spores drawn in then dissolved. It stank faintly like mould. Along with birds and fish food features a lot here, particularly vegetables, pulled out of the ground, tasting wrong: The stew with swede wasn’t very tasty .. the potatoes..cut into chips and heaped in a pile, creamy and wet looking, beginning to turn orange, cold and powdery and bitter to the tongue. This was originally published by the Womens' Press in 1982 (the author restores the original running order though as the Press re-arranged some chapters), but it doesn't seem dated at all, and although a feminist book it is not just for feminists. 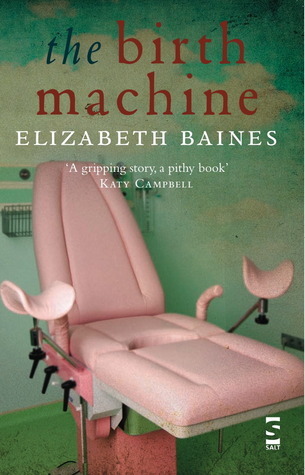 Sign into Goodreads to see if any of your friends have read The Birth Machine.